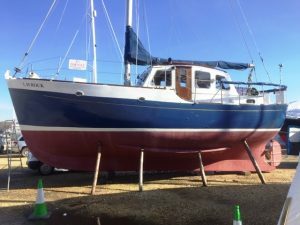 The owner of this fine example of the Salcombe Trader purchased the GRP hull, moulded by Buccaneer Boats, then designed and fitted out the coach roof, deck and interior to a very high, no expense spared, specification. 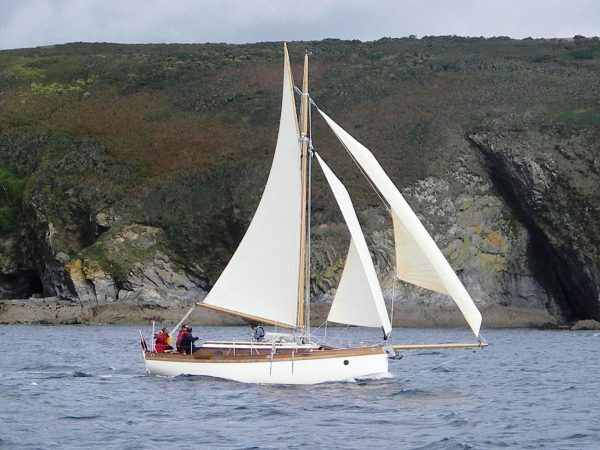 As a cabinet maker, the project was completed alongside his regular work in a lean-to adjacent to his workshop in Cornwall and launched in 2010. The fit out is to a very high standard using the best materials and components available at the time. 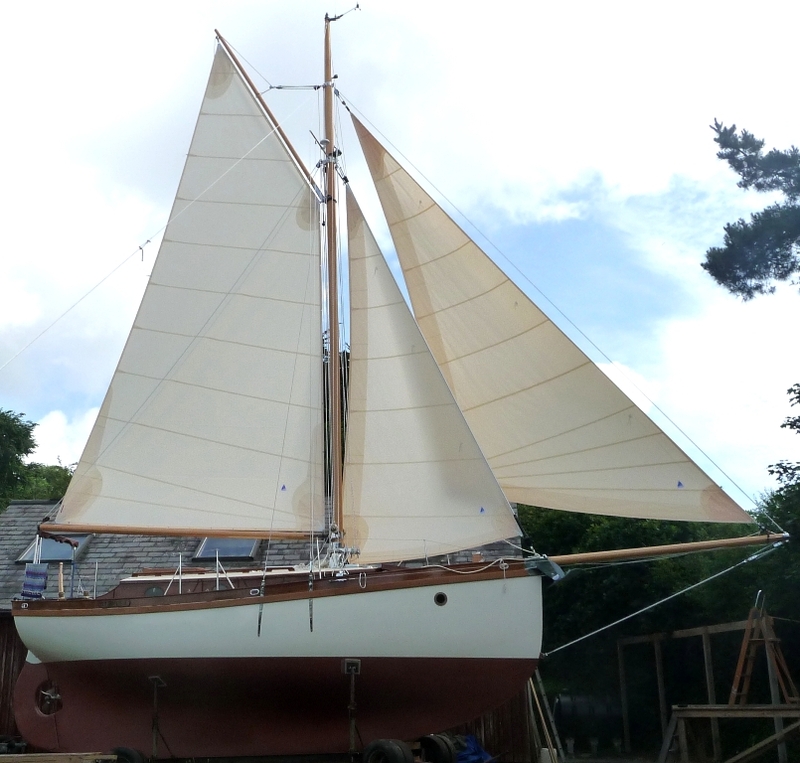 Beam 9ft 6 inches, Draught 5ft, Displacement fully loaded 7 tons, internal epoxy encapsulated lead ballast 3 tons. 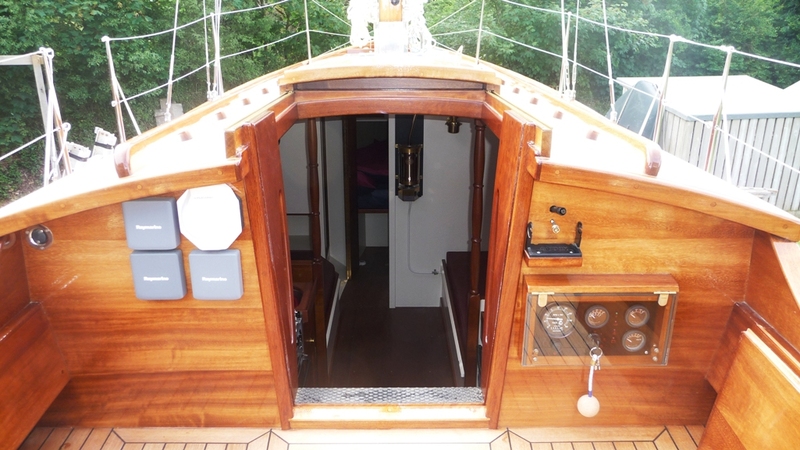 Timbers are as follows: Teak for Sampson posts, cockpit seats, rubbing strake and galley work-top. Iroko for brightwork, bulwarks, coachroof and cockpit coamings, boom crutch, interior doors, framing etc.. Spars are resorcinol glued spruce made by Collars Ltd.
Marine ply decks, epoxy sheathed finished with 2 pack polyurethane non slip paint. 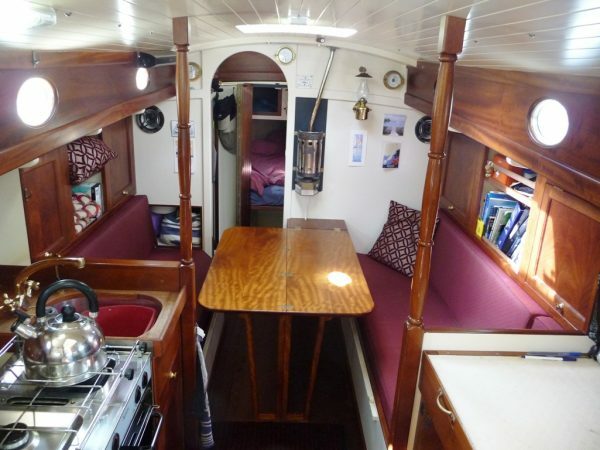 Bronze portlights and winches. 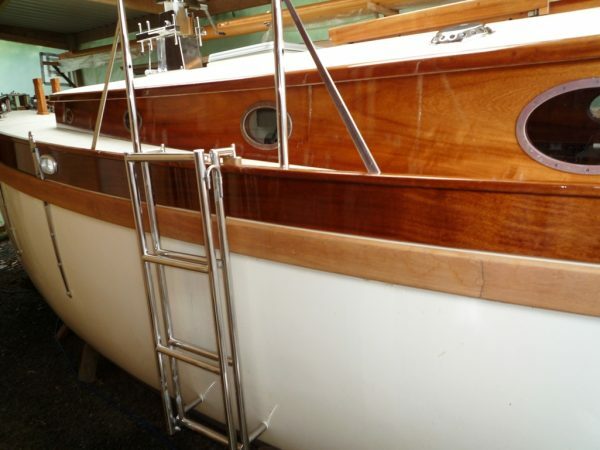 Transom hung rudder with lifting tiller and Raymarine pilot. Numerous custom made stainless steel fittings. 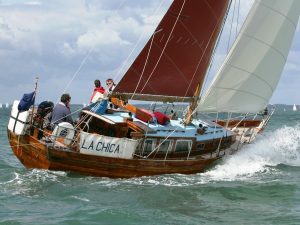 28hp Beta Marine engine. Two batteries with shore hook up for charging. Comprehensive installation of instruments. 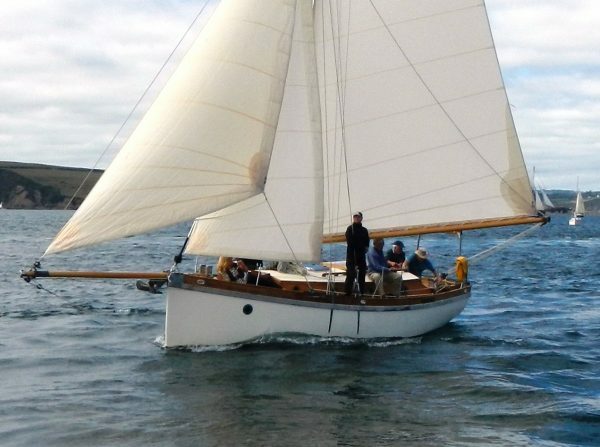 GAFF CUTTER RIG sets 630 sq. ft (58.5 sq. 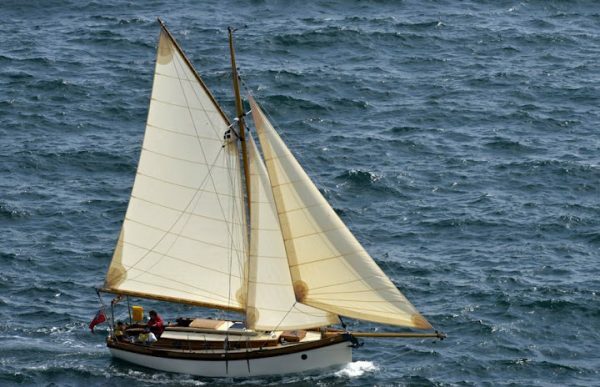 m) total sail area with furling jibs (1&2), furling staysail, bronze roller reefing mainsail and including topsail. 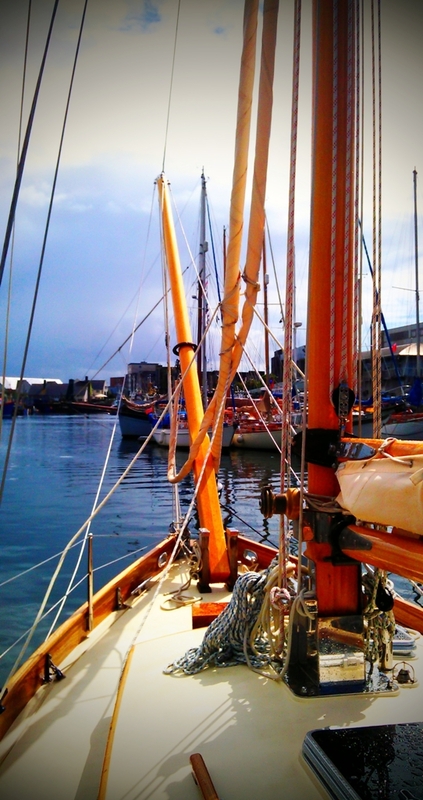 All sails by SKB. Hollow, deck stepped Collars Ltd spruce mast with gaff, boom and lifting bowsprit. Stainless steel standing rigging set up with bottle screws, also whisker shrouds running backstays, stanchions and guard rails. 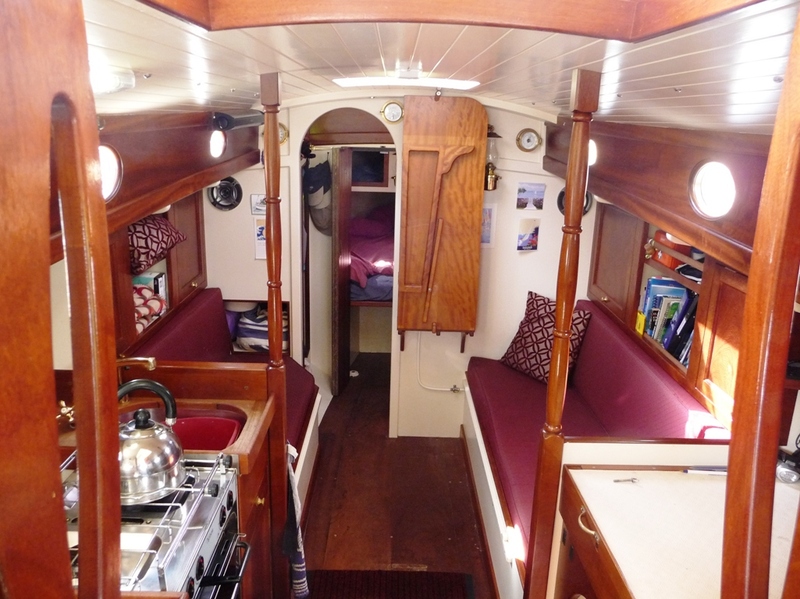 ACCOMMODATION for five – in two cabins. Double fore cabin, two single saloon berths convert to double and quarter berth. Force 10 LPG cabin heater. Iroko table that folds out to double width but also folds up against the main bulkhead to allow converting side berths to a double with roll out slats. Solid bi-fold doors to the fore cabin and heads compartment. 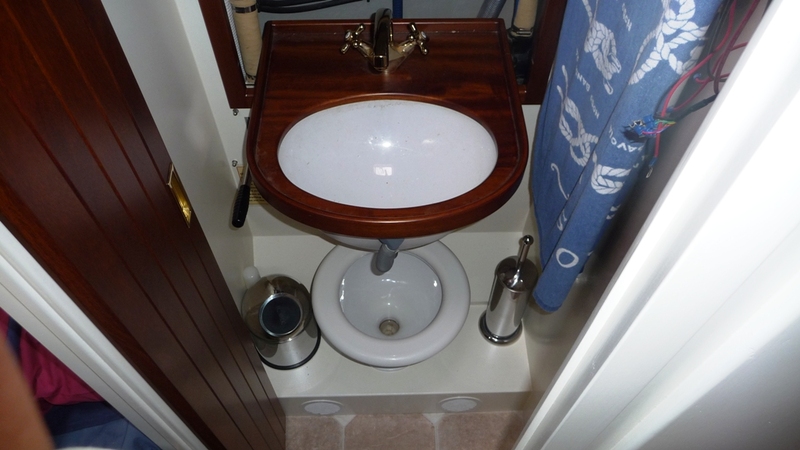 HEADS: with Lavac Marine WC, and fold down wash basin. 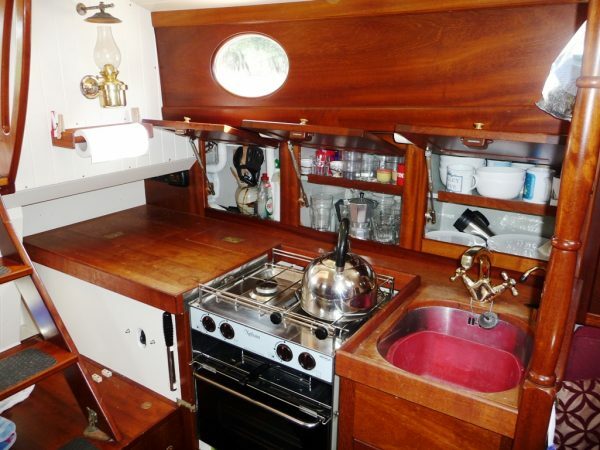 GALLEY: with Nelson Spinflow 1500 two burner LPG hob, oven and grill, gimballed. Teak work-top with under mounted stainless steel sink, waste bin and 12-volt Isotherm coolbox. Hot, cold and filtered water taps. Haztec LPG sensor and control for alarm and remote solenoid switching at the bottle. 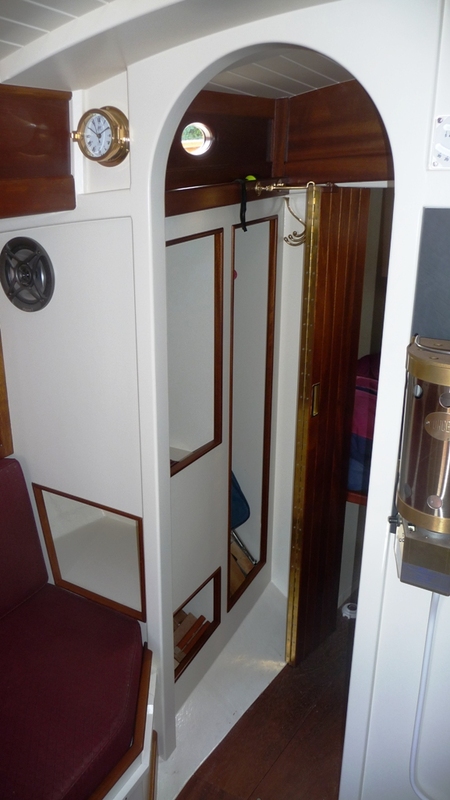 Beta Marine BD1005 3 cylinder 28 HP with 1174 hours on the clock. 100 amp alternator with a smart controller, PRM gearbox, Aquadrive coupling, rope cutter and Axiom 3 bladed bronze prop. Installation with good accessibility and soundproofed removable panels. Dolphin All in One 15amp battery charger and mains circuit breaker linked to shore mains socket. 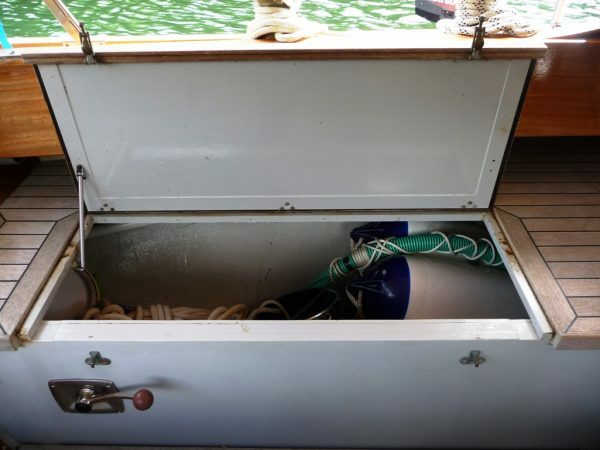 One Henderson manual pump for heads/anchor locker/holding tank with 2-way valves. 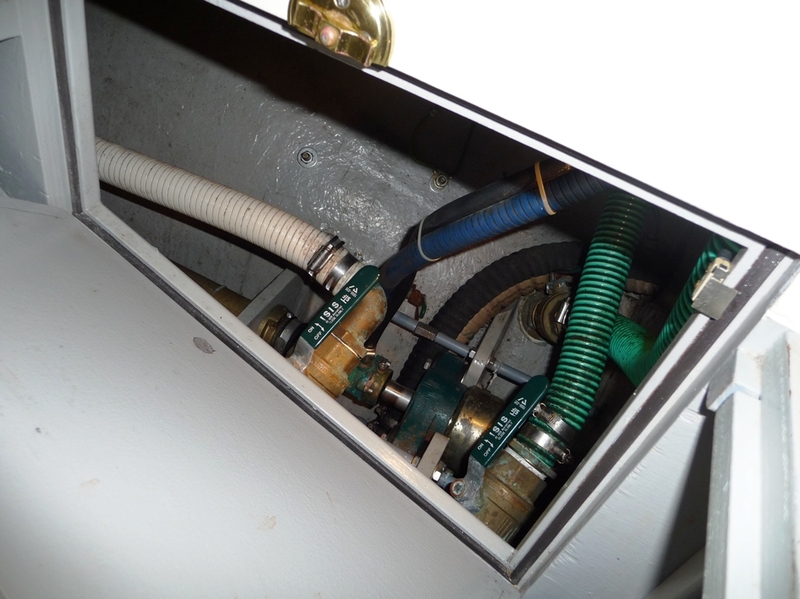 One Henderson manual pump for galley sink and bilges with 2-way valve. One whale automatic bilge pump. 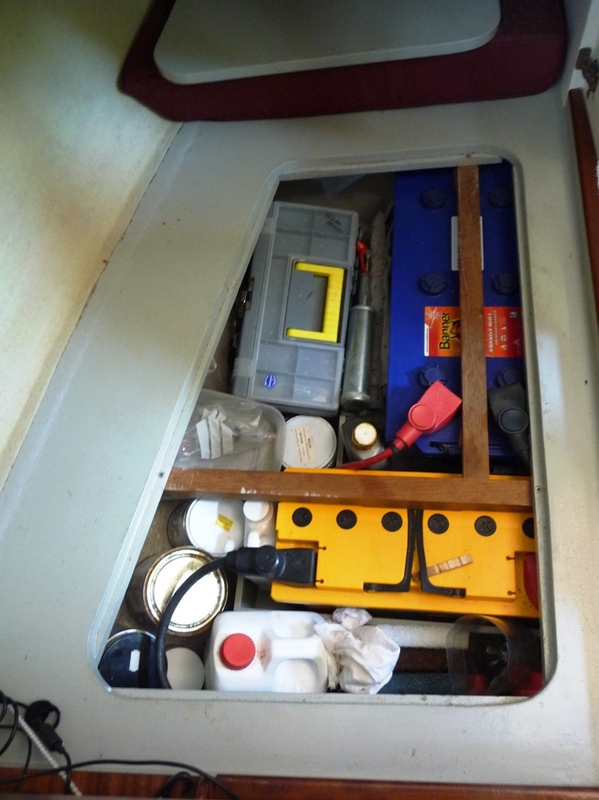 One 180Ahr and one 80Ahr 12-volt battery fully switchable, with alternator and shore hook up. Both batteries monitored by BEP D600-DCM2 meter. Instruments linked via USB to a laptop running various software packages including chart plotter (included in sale). Circuit breaker switchboard and switch panel for LED navigation lights and bilge blower. 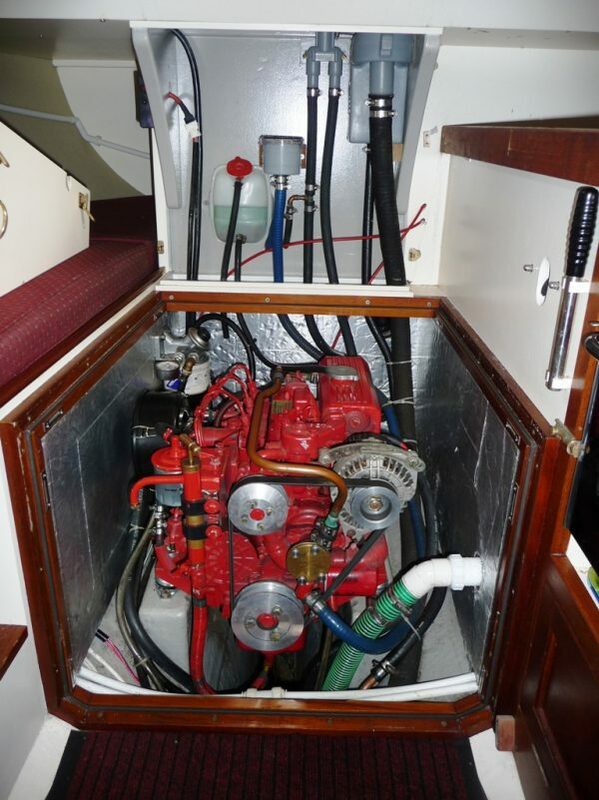 Fuel, water and holding tank gauges. 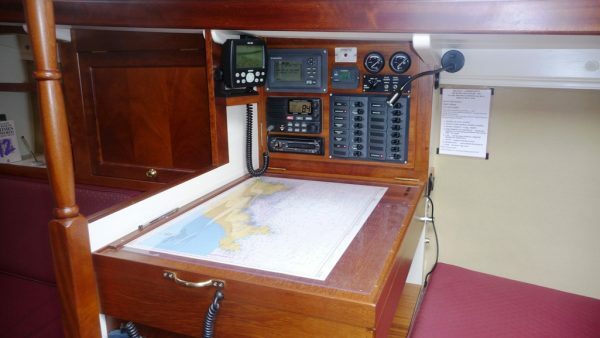 Chart table with under mounted Yeoman paper chart plotter with West Country UKHO folios included. Chain locker for 60m 10mm chain fed by hawsepipe from Quick Electic/manual windlass with remote control and chain counter. Brass ships clock barometer and tide clock. Iroko fore hatch and main hatch. 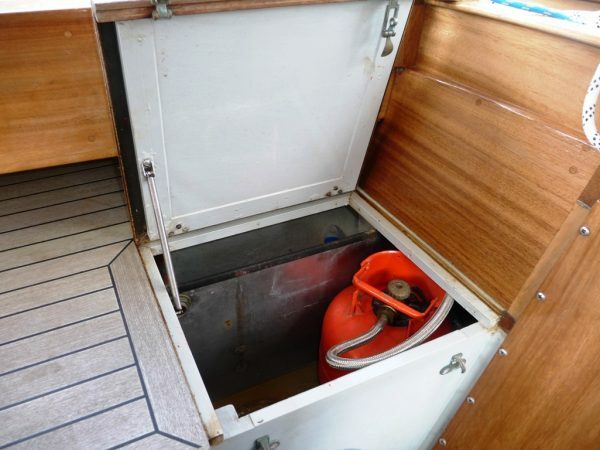 Vetus saloon hatch and 12-volt extractor vents over the galley and in heads. 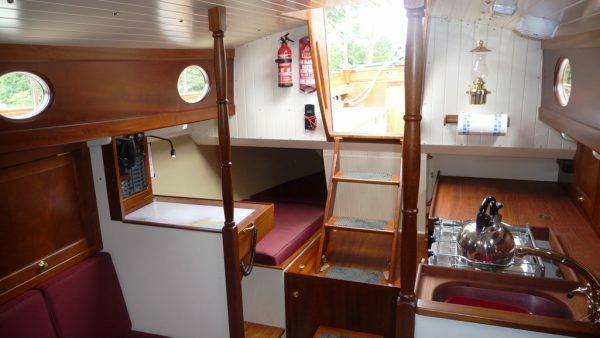 Cockpit gas locker for 2 bottles and a large locker for fenders warps boarding ladder etc. As well as the boom cockpit cover a steel trolley/cradle is included for a safe secure layup. A top quality traditional cruising yacht of immense character and a capable passagemaker. 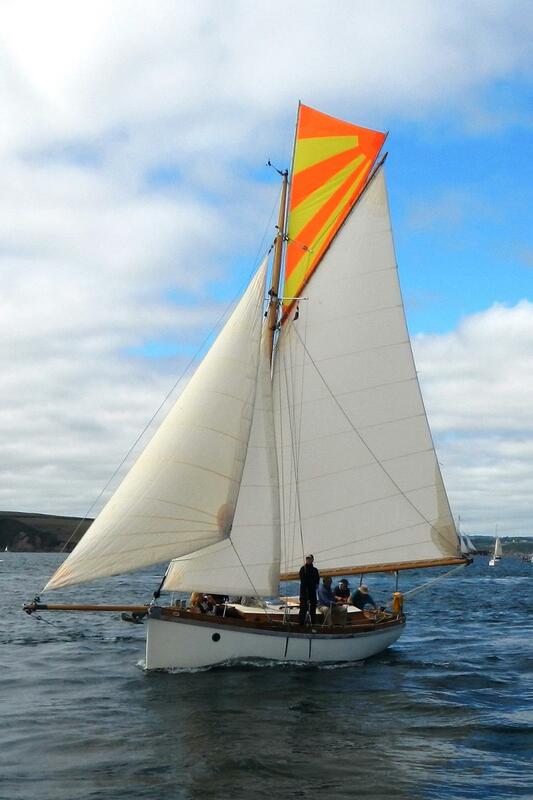 Having the benefit of a ‘classic’ look with the advantage of an easily maintained moulded hull. 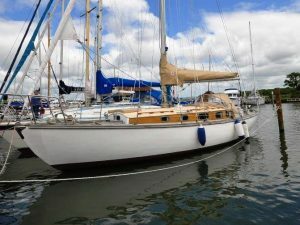 Offered at a competitive price for a relatively new yacht which compares favourably with the Cornish Crabber 30.